There are some rules about time travel, which the Doctor occasionally transgresses, especially when a temporal (or personal) emergency requires it. The Doctor’s home planet, Gallifrey, was destroyed in the last great time war, which means the Doctor is the last of his species (Or is he?). Luckily, he usually has traveling companions, who are often from Earth. As Sarah Jane Smith said in the “School Reunion” episode (170), “the Doctor likes traveling with an entourage; sometimes they’re human, sometimes they’re alien, and sometimes they’re tin dogs.” He also encounters quite a few memorable beings and/or species in his travels. Some are notorious, some just ordinary citizens of whatever planet he happens to visit. Earth just happens to be the planet he visits most often. In the paragraphs below and in part two of the blog, which will appear on Saturday, Nov. 23, several resident “Whovians” describe what they feel are the most significant elements of Doctor Who. “Doctor Who?” is a very good question indeed. Over the years the title character of the Doctor has been played by a number of different actors. In the opening paragraph to this post, Luisa refers to the Doctor’s ability to regenerate. This concept that the Doctor’s alien race (the time lords) can regenerate, totally changing their appearance, was introduced to the series in 1966 as a way to keep the show going after the departure of William Hartnell, the first actor to play the Doctor. Regeneration not only results in a change in the Doctor’s appearance but also in changes to his personality as well. This allows both for an interesting evolution of the character and for each actor who plays the Doctor to give his own unique approach to the role. The practice of regeneration has also lead to the different incarnations of the Doctor being referred to, by fans, in the order in which they played the doctor, as a quick and easy way to differentiate them. And following the 2013 Christmas special, the current Doctor played by Matt Smith will be replaced by Peter Capaldi as the 12th Doctor. 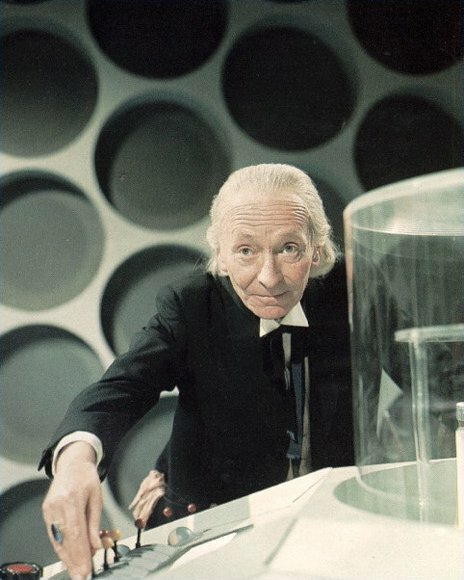 It should be noted that on occasion other actors have also stood in for past Doctors; for example in “The Five Doctors” (1983, produced in celebration of the 20th anniversary), Richard Hurndall played the first Doctor due to William Hartnell’s death in 1975. Furthermore, there is some controversy in Whovian lore as to how many times a time lord, and more specifically the Doctor, can regenerate. Until recently it had been fairly well established that a time lord could regenerate 12 times with a total of 13 different incarnations. However, some claim that due to certain events that have taken place in recent seasons, there is now no limit to the number of times the Doctor may regenerate. At its start, Doctor Who was designed in part to educate its viewers about history, and series creator Sydney Newman insisted on “no bug-eyed monsters” in the show. In spite of this prohibition, the second storyline to be broadcast featured the Daleks, a race of creatures deformed by nuclear war and forced to live inside robot-like metal cases. 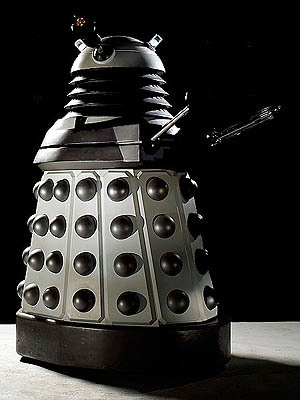 The iconic appearance of the Daleks, combined with their grating (and fun-to-imitate) voices, sparked “Dalek-mania” in Britain, rocketing the series to success and leading to a flood of Dalek merchandise, from countless toys to the infamous “I’m Gonna Spend My Christmas With a Dalek” single. From this point forward, Doctor Who was destined to be as much about monsters as about history, and as the years passed, the emphasis on historical fiction steadily diminished. The Daleks frequently returned to menace the Doctor and his friends, and countless other creatures were introduced in an effort to replicate their success. The second-most-famous foes are likely the Cybermen, humans who have lost their humanity through mechanical enhancement (an idea seen on Doctor Who long before Star Trek’s Borg came along). Other noteworthy creatures include the Ice Warriors, the inhabitants of Mars prior to its desertification; the Sontarans, a race of squat, battle-hungry clones locked in perpetual war with the shape-shifting Rutans; the Sea Devils and Silurians, sentient reptiles in hibernation since the time of the dinosaurs; and the Autons, deadly humanoid tools of the Nestene Consciousness, an alien force capable of animating anything made of plastic. Part of the fun of Doctor Who is seeing how it draws on its own rich history; it is not uncommon for contemporary episodes to incorporate elements recycled from the show’s distant past. The current season, for example, features the Great Intelligence, an enemy last seen manipulating robotic Yeti in 1968. Of course, it is not necessary to know the show’s history to enjoy its current episodes — everything tends to stand alone quite well – but, the more you learn, the more clever connections and references you are likely to notice. Contributors include Laura Bang, digital and special collections curatorial assistant, Special & Digital Collections team; Luisa Cywinski, editorial coordinator, Communication & Service Promotion team and team leader, Access Services; Demian Katz, library technology development specialist, Technology Development team; Sarah Wingo, team leader, Humanities II and subject librarian for English, literature and theatre. Thanks for the article! It’s been interesting to see how the availability of the internet has changed how people interact with the Doctor – particularly the older episodes that you mention. It makes those references to the show’s own history so much more accessible for new viewers drawn in by the 9, 10, and 11 Doctors.